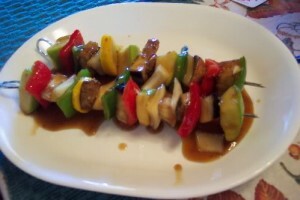 Garlic Veggie Kababs recipe by maham at DesiRecipes.com. Blend together garlic , egg, oil, cornflour, refined flour, soya sauce, hot sauce, both red chillies and salt in blender. Put blended mixture in a bowl, add veggies and set aside for 1/2 an hour. Skewer veggies onto sticks and either grill them or fry on a griddle. Serve tasty garlic veggies with sweet and sour dip.